The Moon spins like a top on its axis as it travels around the Earth, and at the same time the Earth is orbiting the Sun. The Moon's orbit is slightly elliptical and its mean orbital radius is 384 400 kilometres. At closest approach (perigee) the orbital radius is 356 000 kilometres and at its greatest distance (apogee) it is 407 000 kilometres. The Moon takes 27.3 days to go once around the Earth and it also takes this time to rotate once on its own axis. Because of this, we always see the same side of the Moon from Earth. 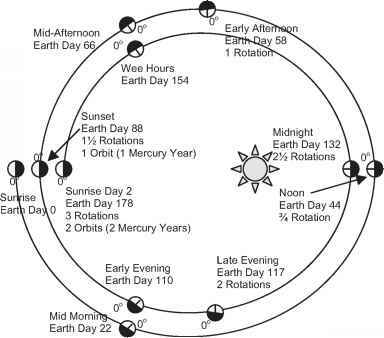 As the Moon orbits the Earth, the angle between the Earth, Moon and Sun changes, and we see this as the cycle of Moon's phases (Figure 6.15). The time between successive new moons is actually 29.5 days, slightly different from the Moon's orbital period (measured against the stars), because the Earth moves a significant distance in its orbit around the Sun in that time. The Moon appears to wobble on its axis because its orbit is elliptical. As a result we can see a few degrees of the far side of the Moon's surface from time to time. 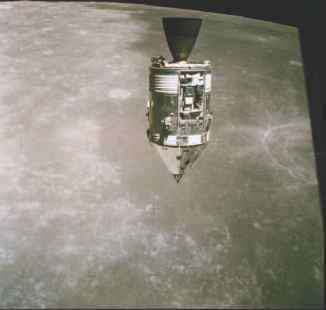 Most of the far side was completely unknown until the Soviet spacecraft Luna 3 photographed it in 1959. The far side of the Moon gets sunlight half the time. Whenever we see less than a full moon, some sunlight is falling on the far side. Throughout each cycle of lunar phases, both sides of the Moon get equal amounts of sunlight.